In having attempted to think with the Six Thinking Hats metaphor developed by Edward de Bono and attemping to extend it by creating a Six Coat metaphor, I came to the conclusion that Edward was taking the wrong approach. He was using different colors, but he was not differentiating by shape. Consequently, his mnemonic device was hard to retain. Using the icons I created in the previous post I am now going to abandon Six Hats, Six Coats and abstract the Zachman Framework for Enterprise Architecture using these new mnemonic devices. I hope to improve them with time. All concepts are created only by motives. 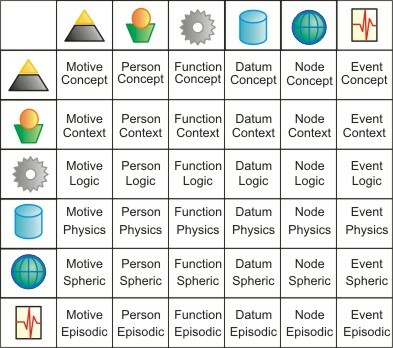 Each motive has a unique set of the six focus concepts or entities. All contexts are created only by people. Each person has a unique set of the six focus contexts or relationships. All logics are created only by functions. Each function has a unique set of the six focus logics or attributes. All physics are created only by data. Each datum has a unique set of the six focus physics or constraints. All spherics are created only by nodes. Each node has a unique set of the six focus spherics or definitions. All episodics are created only by events. Each event has a uniques set of the six focus episodics or manipulations. This is what social networks are teaching us on a smaller scale. When we look at a social network we are seeing contexts being created by persons. But there are five additional focuses (motives, functions, data, nodes, events) that create five additional perspectives (concepts, logics, physics, spherics and episodics) respectively. This we do not fully understand or apply. Although our thinking is organic and we do not recognize the above framework, any reproduction and refinement of the results would require recording and executing them in this disciplined fashion.